American photochemist; born at Stenowitz, Bohemia, Oct. 12, 1846. He went to America in early life, and was educated at Detroit; he studied especially mathematics and astronomy at Michigan University in 1866, and optics at Detroit. He was connected with the meteorological observatory of the United States Lake Survey District in 1866, and engaged in researches in microscopic photography during 1869 and 1870. This led to his invention of a method of photochemical engraving, the "Levytype," which was patented in 1875. He established a company in Baltimore, but removed to Philadelphia in 1877, in which year he invented the "Levy line-screen," which was perfected by his brother Max. For this he received the John Scott Legacy medal at the Franklin Institute in 1897. He invented a new process of intaglio engraving, the "photo-mezzotint," in 1889. In 1896 he invented a new method of etching, the "Levy acid blast," for which he received the Elliott Cresson gold medal at the Franklin Institute in 1899. He was awarded a medal and diploma at the World's Columbian Exposition in 1893, and decorations and diplomas from the Imperial Photographic Society of Moscow and at the recent Paris Exposition. 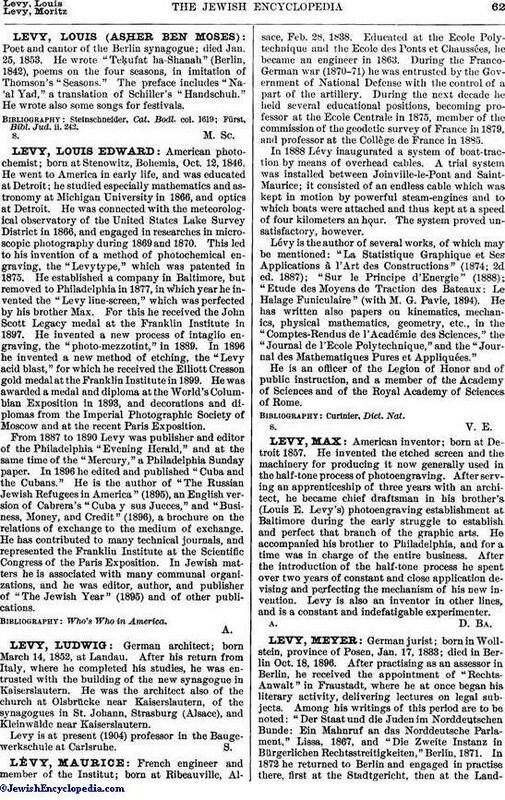 From 1887 to 1890 Levy was publisher and editor of the Philadelphia "Evening Herald," and at the same time of the "Mercury," a Philadelphia Sunday paper. In 1896 he edited and published "Cuba and the Cubans." He is the author of "The Russian Jewish Refugees in America" (1895), an English version of Cabrera's "Cuba y sus Jueces," and "Business, Money, and Credit" (1896), a brochure on the relations of exchange to the medium of exchange. He has contributed to many technical journals, and represented the Franklin Institute at the Scientific Congress of the Paris Exposition. In Jewish matters he is associated with many communal organizations, and he was editor, author, and publisher of "The Jewish Year" (1895) and of other publications.